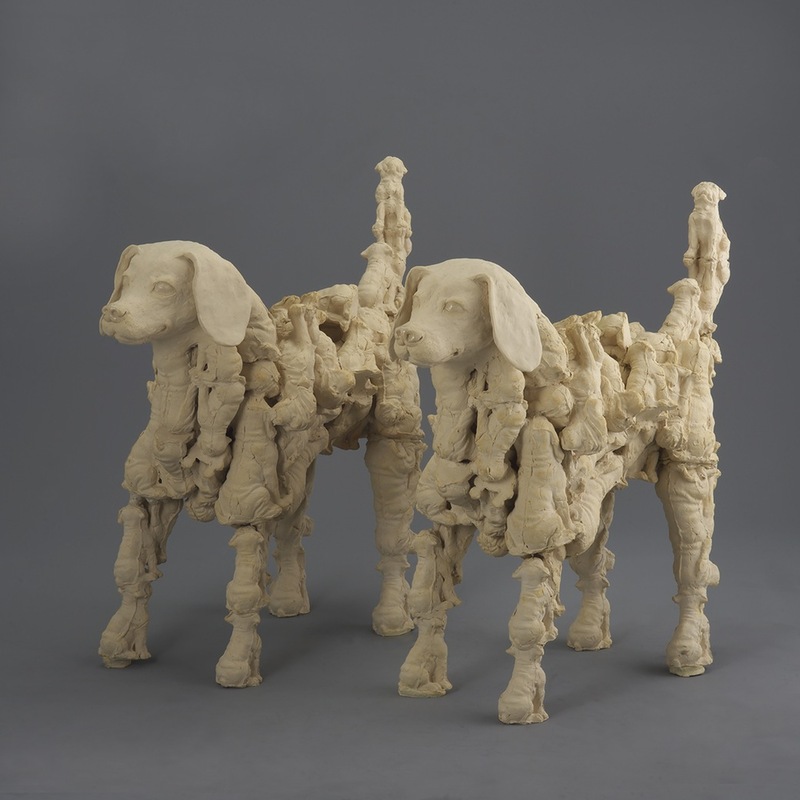 Learn about sculptures in the permanent collection, new acquisitions, exhibitions and more. 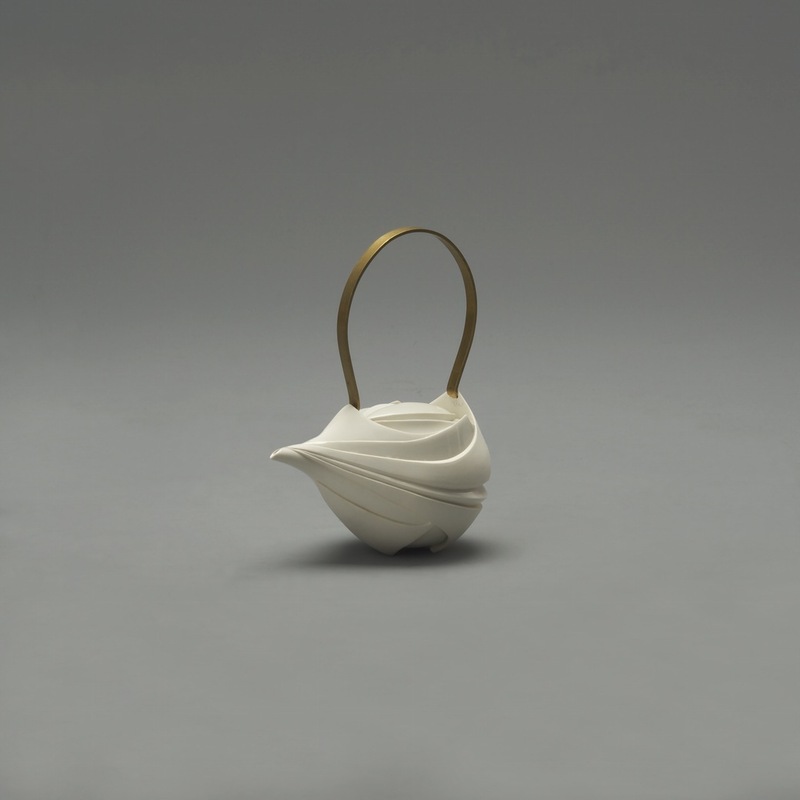 Tradition and Innovation: Japanese Ceramics Now brings together twenty-five of the leading ceramics artists from across Japan. 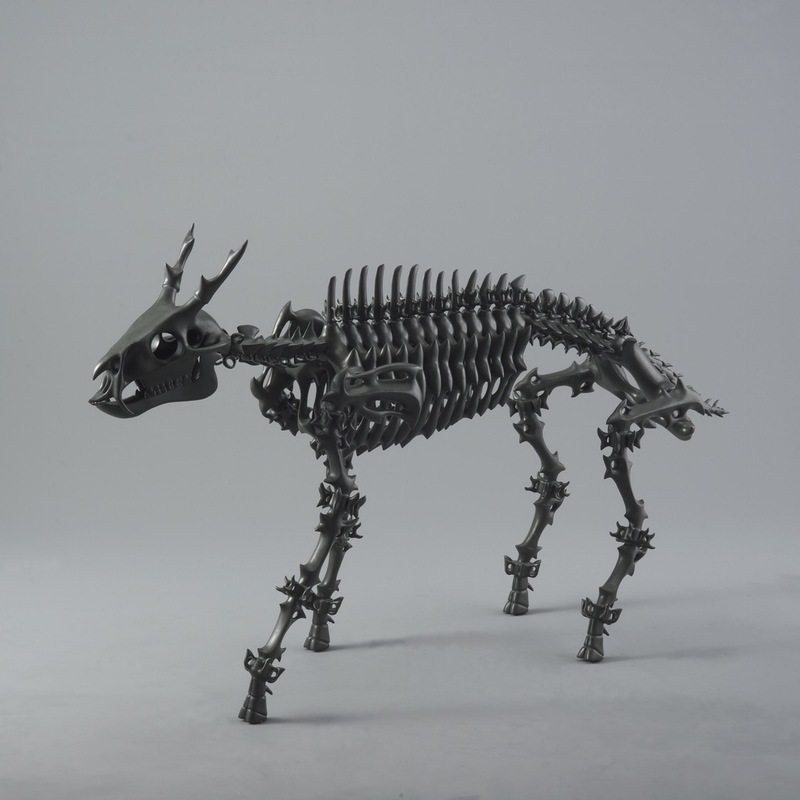 Most of these artists are widely recognized and critically acclaimed in Japan, few have exhibited here in the United States. This exhibition truly is a must see experience here at Frederik Meijer Gardens & Sculpture Park! 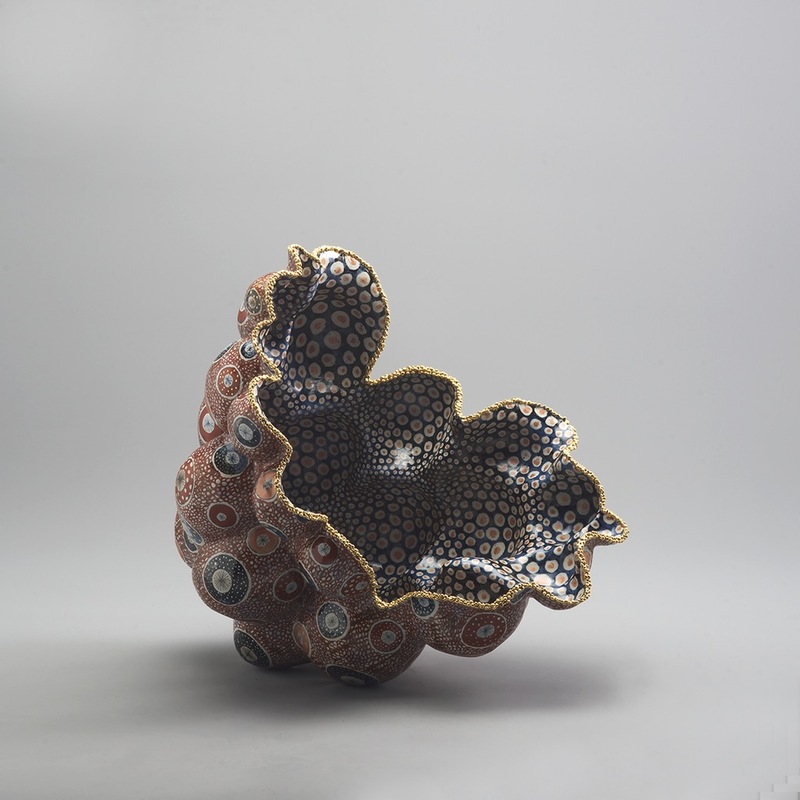 For centuries, functional and decorative ceramic arts in Japan have been appreciated and collected across the globe. 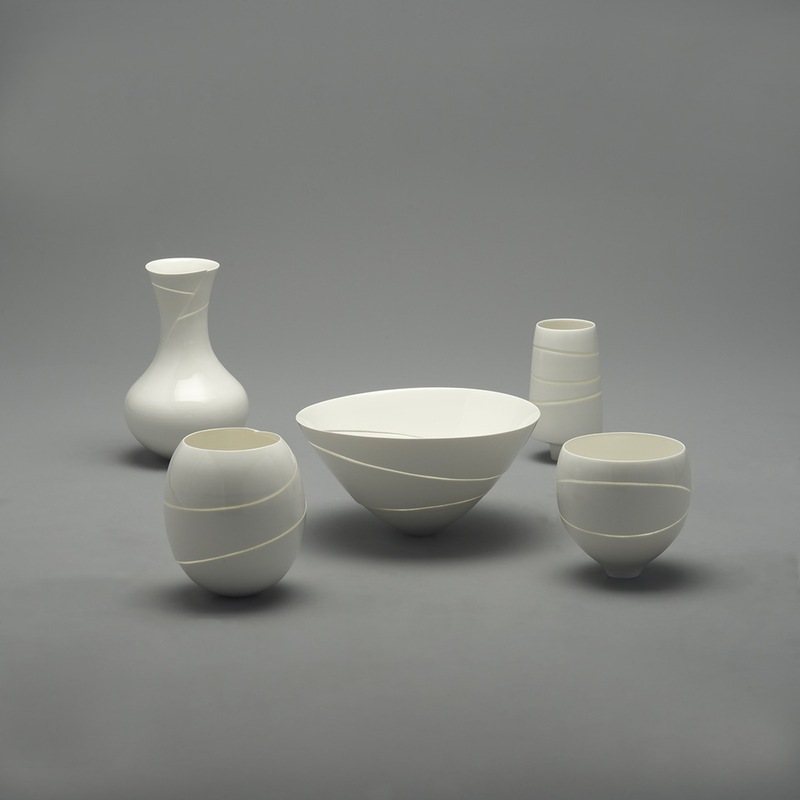 In many ways, Japanese ceramics have become iconic references for Japanese culture at large. Tradition and Innovation: Japanese Ceramics Now illustrates that ceramics are a living and expanding tradition, and many of today’s leading artists are highly inventive, exhibiting great creativity in form, content and technique. 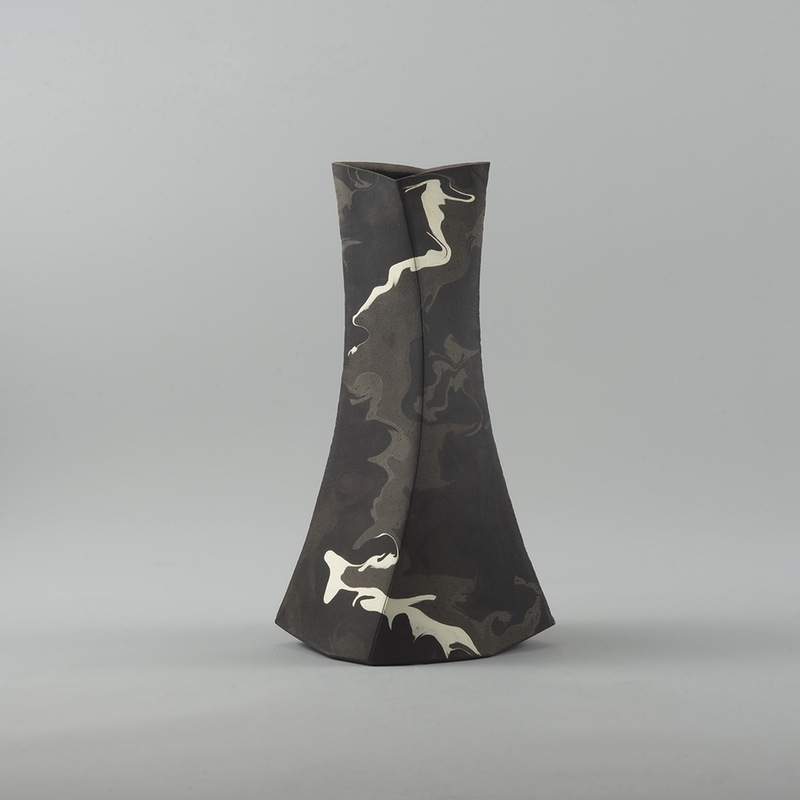 Tradition and Innovation: Japanese Ceramics Now is a highly unique exhibition bringing together 25 of the leading ceramics artists from across Japan. Although most are widely recognized and critically acclaimed in their native country, few have exhibited in the United States – making this a must see exhibition experience. Over the next few weeks, we will be introducing you to the participating artists in their own words and showing you their works. All 25 masters participating in the exhibition are Japanese, making this the first all-national venue in ArtPrize history! Created by its original technique called “Ligne Hotaru”, it has developed from the traditional Japanese technique “Hotarude”. Its delicate lines of light take us to the other side of everyday life. Throughout the course of Splendors of Shiga: Treasures from Japan, we’ll be featuring some of our favorite works of art from the exhibition and providing a more in-depth look at some of our favorite pieces. This meticulous work is on loan from the Museum of Omihachiman City—Grand Rapids’ Sister City in the Shiga Prefecture. 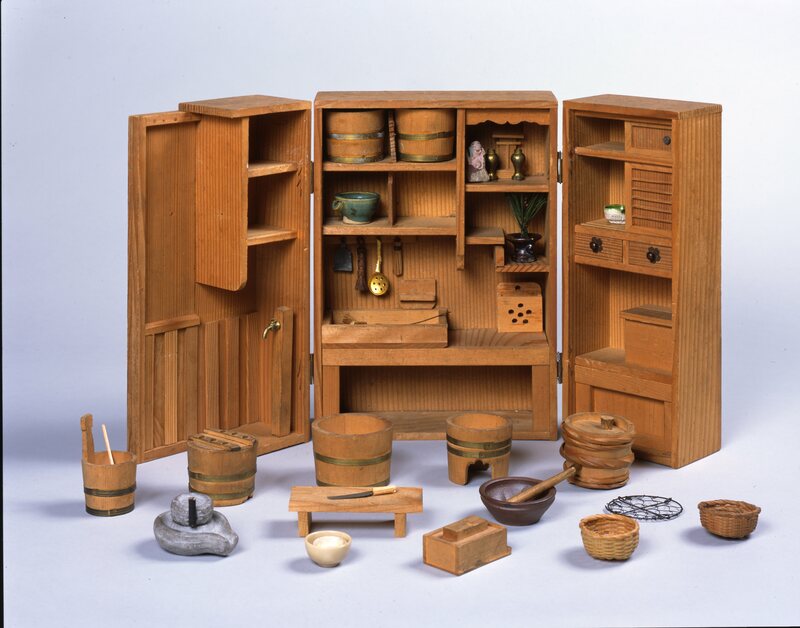 It is a perfect scale model of a traditional Japanese kitchen and its wide range of instruments and utensils. Originally, it would have been commissioned by a wealthy merchant family for young children. More than simply a toy, it would have been essential to their success in future life. Note the complete mastery of numerous materials in wood, metal and ceramic, which replicate everyday objects in minute detail. 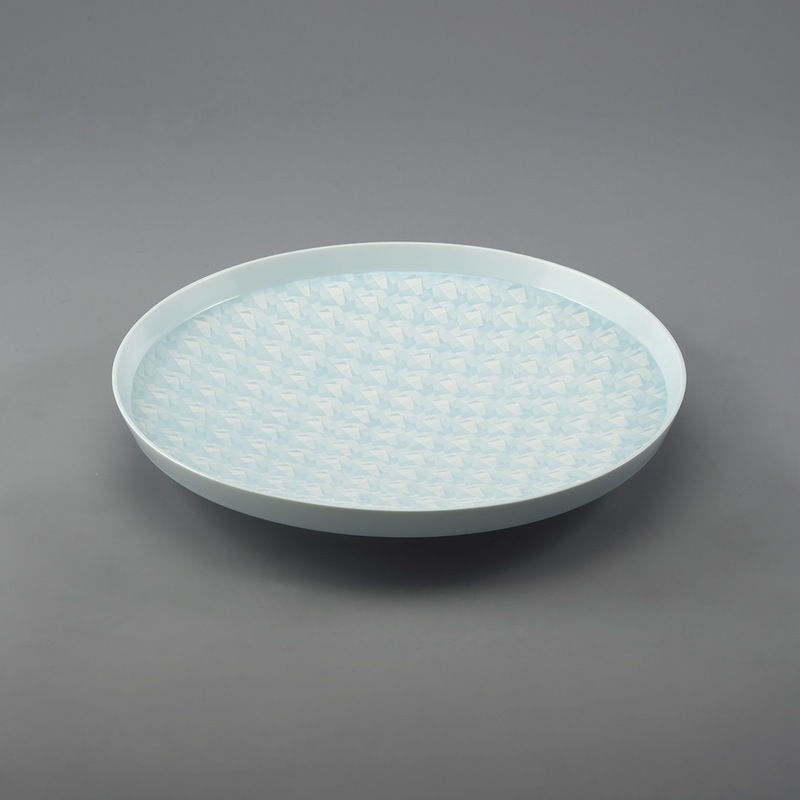 Koto Ware, a highly refined form of ceramics from Shiga Prefecture, flourished in 19th century. The kiln where this nest box was created opened in 1842 in the city of Hikone, and produced luxury items until 1862. The delicacy and decoration of Koto Ware was the antithesis to the irregular shape and earthy colors and textures of Shigaraki pottery. 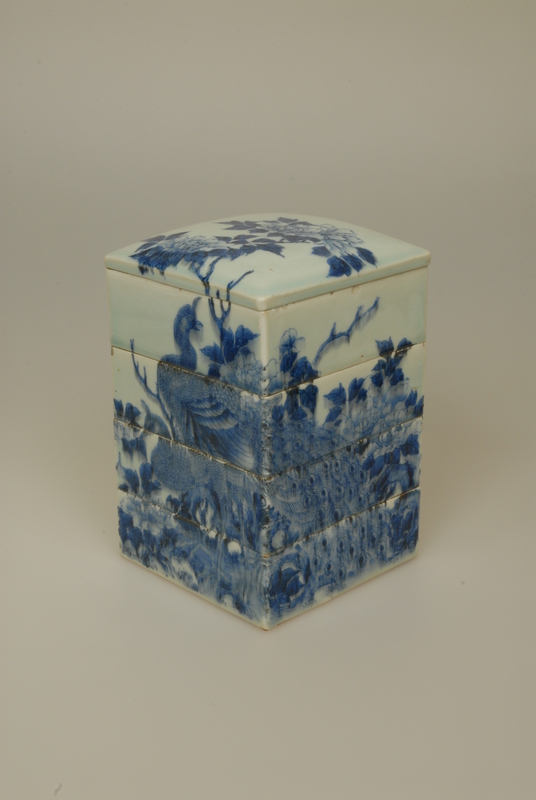 This multi-tiered stackable box was meticulously made and decorated by hand. The square shape and flat bottoms of each level would have been difficult to create and could only have been produced by an artist of the highest skill. It originally functioned as a type of luxury lunch box perhaps given as a royal gift and used only for special guests. The namesake decorative elements of the peacock and peony are found across the exterior. Such forms were undoubtedly influenced by the art of China. So too, the use of porcelain with blue underglaze also evidences an interest in Chinese art and pottery. 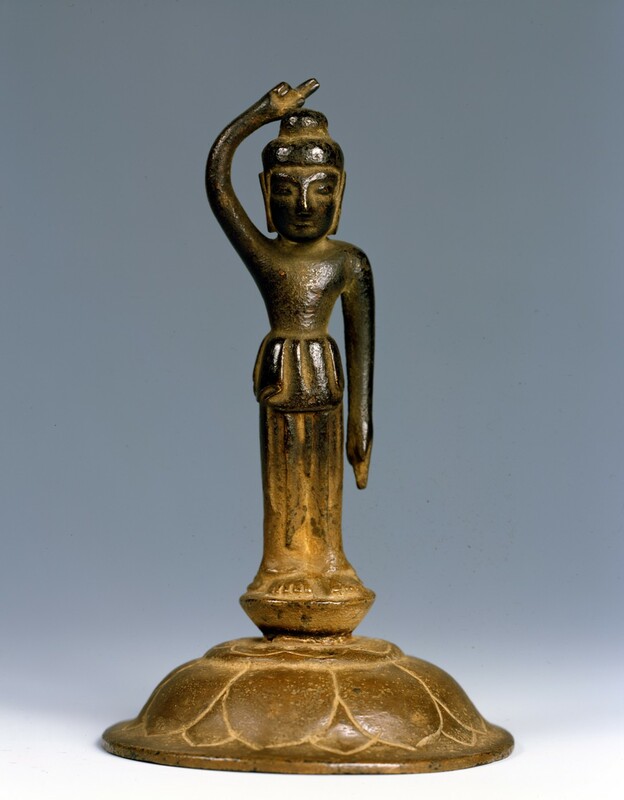 This figure represents the central deity of Esoteric Buddhism. Simply put, he represents the Supreme Buddha seated atop the iconic lotus flower. Traces of gold leaf can be found across the surface of the cast bronze figure suggesting the prominence of the sculpture. An extremely rare loan from the Binman-ji Temple, this sculpture is among the oldest objects on display in this exhibition. Located in the rural city of Taga Town, this temple was one of the most visited and prosperous temples of medieval Japan (13th-16th century). 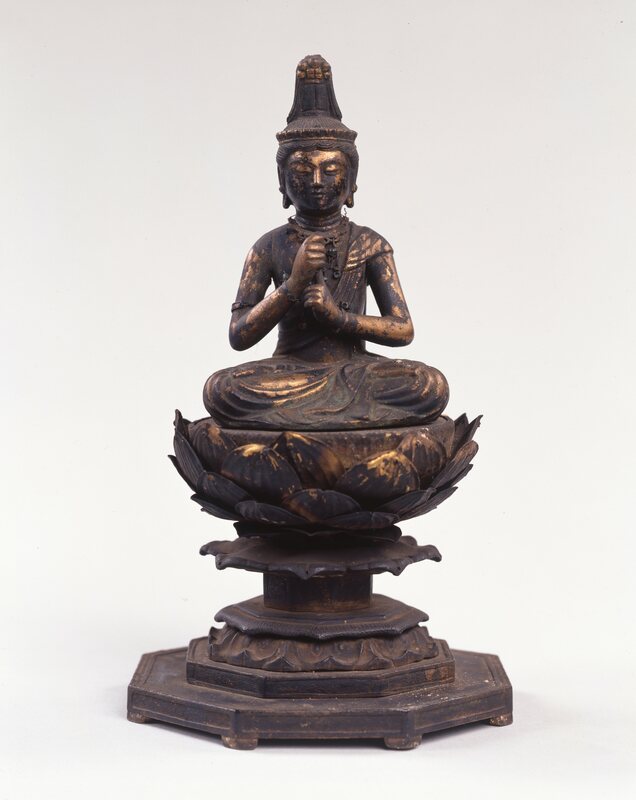 The firmly seated position and contemplative demeanor are iconic for Buddhist statuary. Although the body and floral form are decidedly iconic, there is a strong vertical structure to this composition. One can easily follow a visual central core that stretches from the conical headdress through the torso of the figure down to the pedestal upon which the Buddha rests. Such a strong central core grants the illusion of monumentality to the sculpture. Throughout the course of Splendors of Shiga: Treasures from Japan, we’ll be featuring some of our favorite works of art from the exhibition and providing a more in-depth look at some of these pieces. This rare sculpture from the 8th century describes the infant Buddha. According to tradition, the infant took seven steps from his mother, pointed to the heavens and declared he was venerable on both heaven and earth while under his feet lotus flowers bloomed. The sculpture describes a very young figure pointing to the heavens with his right hand and to the earth with his left hand; beneath his feet is a stylized representation of a lotus flower. Figures such as this were placed on display at festivals celebrating the Buddha’s birth on April 8. Then, it would have been surrounded by flowers and sweet tea poured over the figure. The latter possibly accounts for the surface colors seen today. 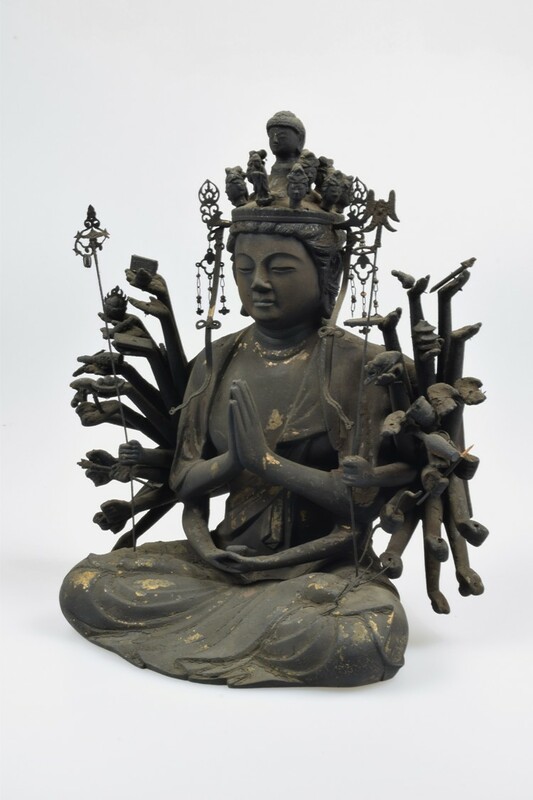 On loan from the Daiko-ji Temple, it is one of several Buddhist devotional figures and accessories which will be on display over the course of the exhibition. The ancient bronze shown above,Seated Senju Kannon, is on loan through the Kannon-ji Temple located on the shores of Lake Biwa in the center of the Shiga Prefecture. It represents the God of Mercy who, according to Buddhist beliefs, has the highest rank after the Buddha himself. The figure is described with multiple arms at his sides and multiple heads atop his head symbolizing a thousand armed and a thousand eyed deity capable of managing everything in the universe and able to save all situations in the world. A subject of great devotion, this deity also appears frequently in traditional paintings from the 16th through the 18th centuries. Careful observation of this bronze form reveals traces of gold leaf indicating the sculpture was at one time completely gilded. This is another of the several Buddhist devotional figures and accessories that will be on display over the course of the exhibition. 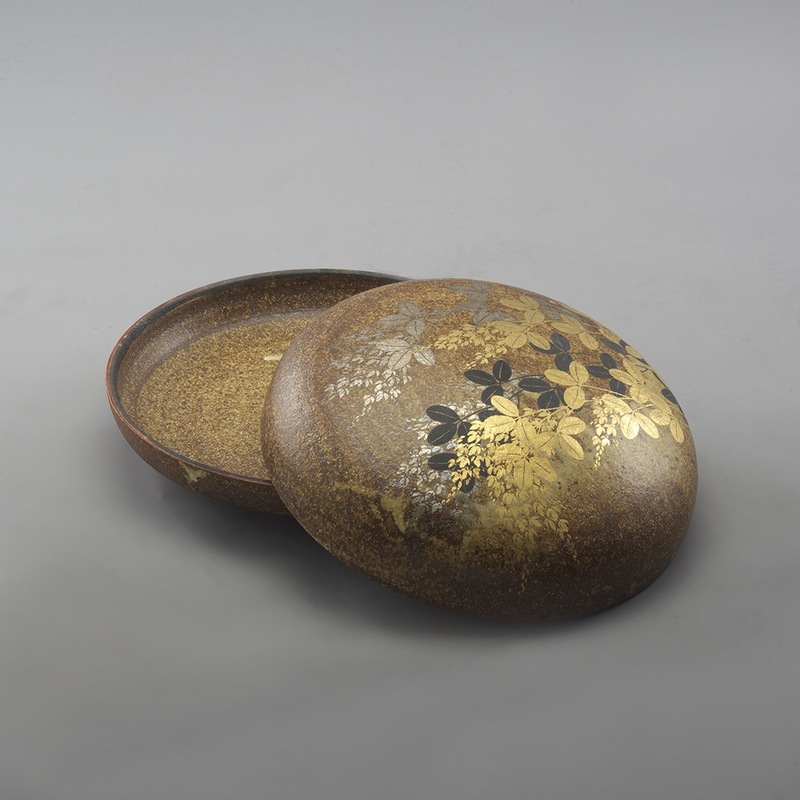 Click HERE to learn more about our Splendors of Shiga: Treasures from Japan exhibition. 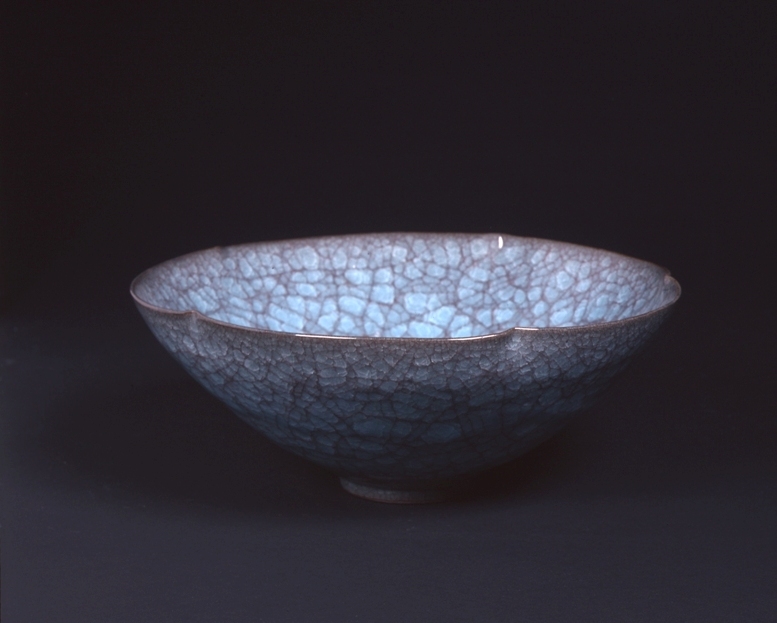 This tea bowl was made by Ueda Naokato who is a specialist in tea ceremony ceramics. A leading master of the famed Shigaraki pottery, he is the fifth generation of his family to work in this tradition and is revered as a Shiga Prefectural Intangible Asset or Treasure. 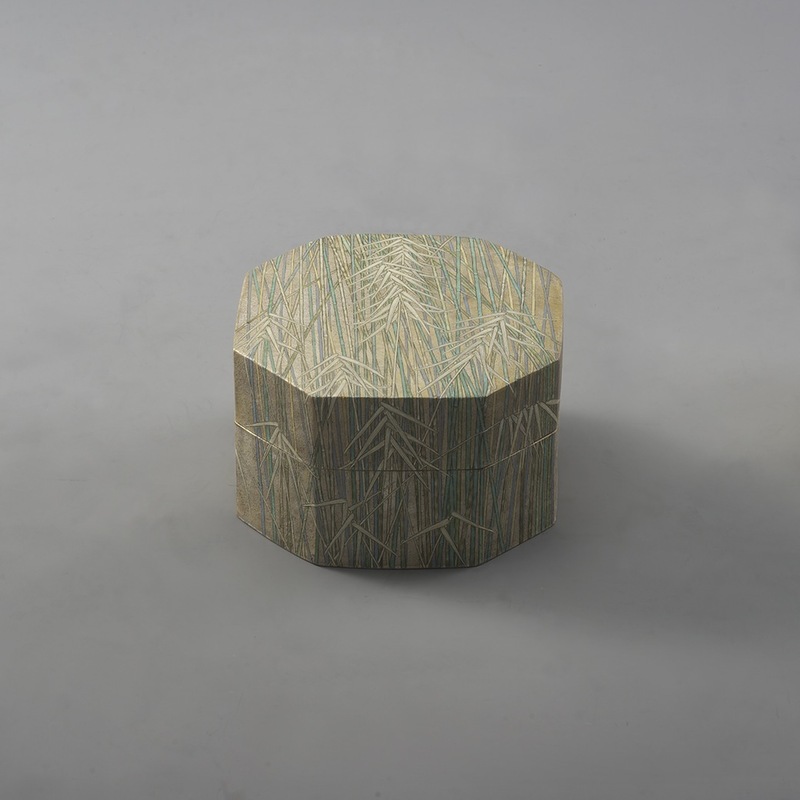 The earthen colors, highly textured surfaces and slightly irregular form epitomize the Shigaraki tradition. 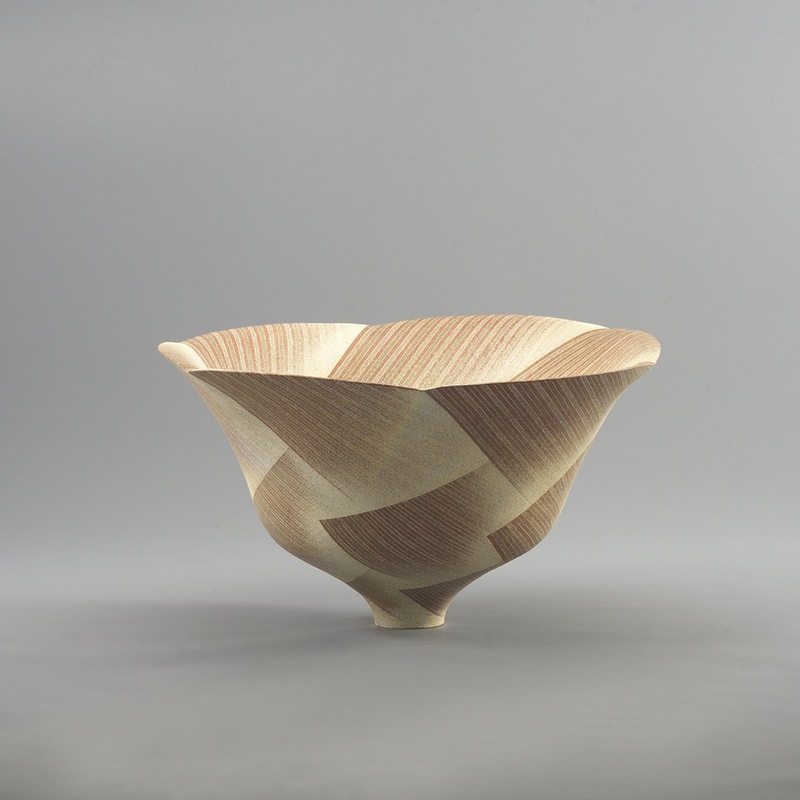 This vessel was made on a hand-propelled wheel and in a wood-fired kiln. The fingerprints seen on the interior base of this bowl are intentional. Works by Naokato have also been commissioned for use in the teahouse in the Richard and Helen DeVos Japanese Garden. 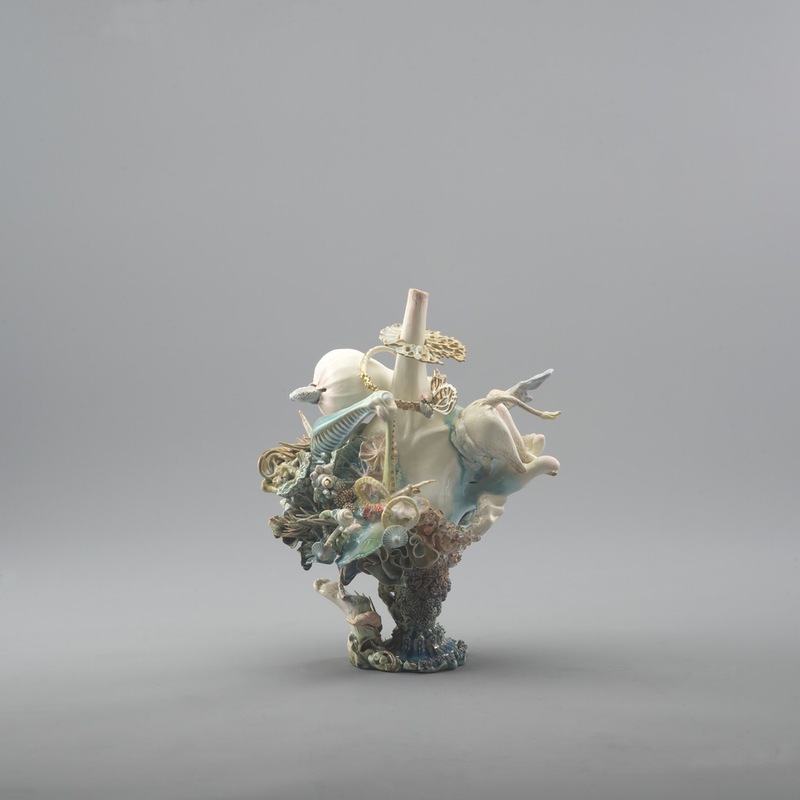 This particular vessel will be on display over the entirety of the exhibition. 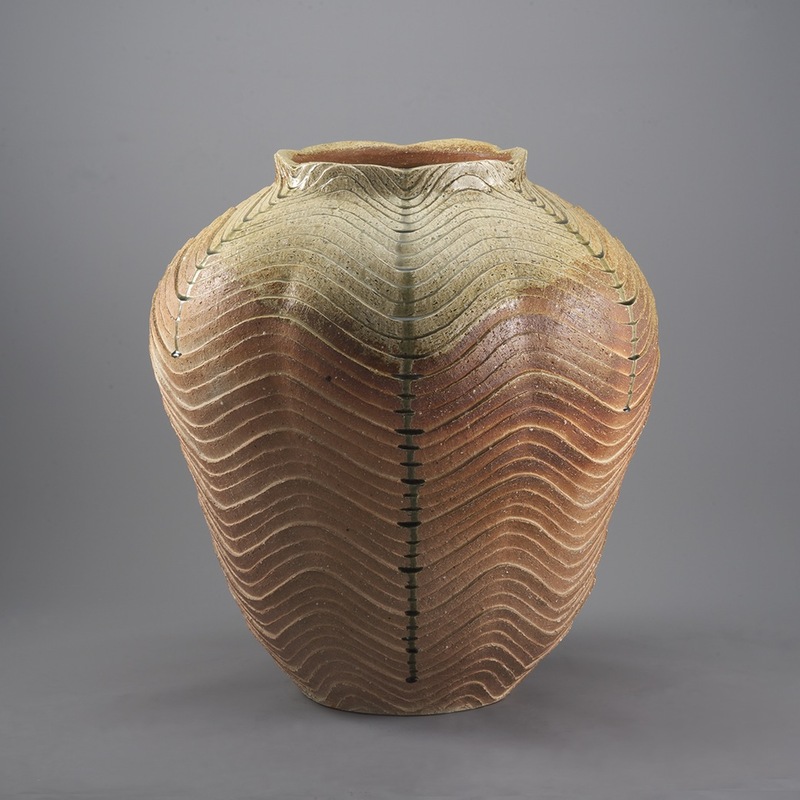 This vessel was made by Takahashi Shunsai, a specialist in ceramic vases and jars. Part of a family of potters, he is celebrated as a Shiga Prefectural Intangible Asset or Treasure. 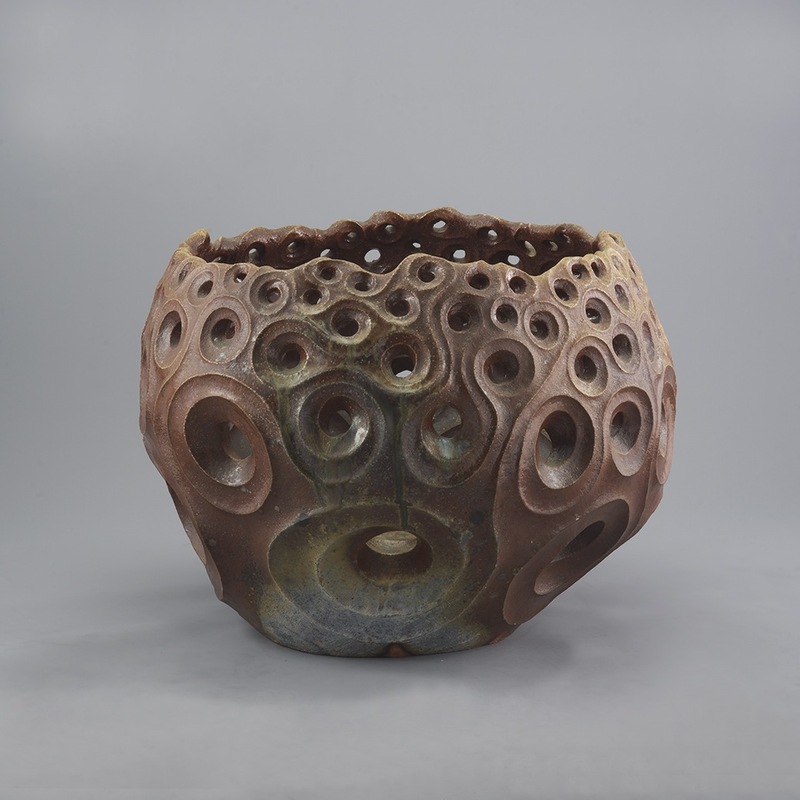 Although he initially follows traditional shapes, he has experimented with forms, firing techniques and natural glazes as a means of bringing the history of Shigaraki pottery into the modern age. 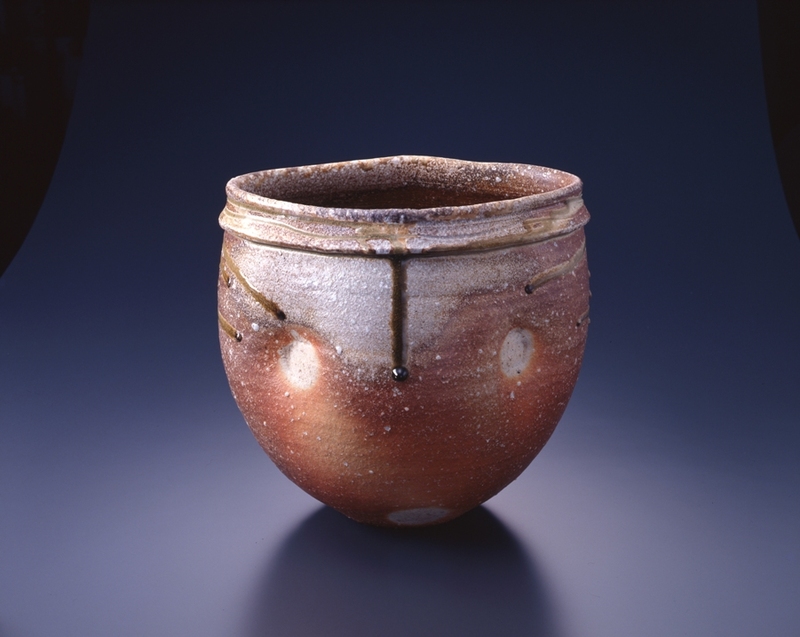 The carefully marked glaze decoration on this vessel has not been painted, but results from the chemical reaction of wood ash across the surface of the clay and the controlled movement of air in the firing process. 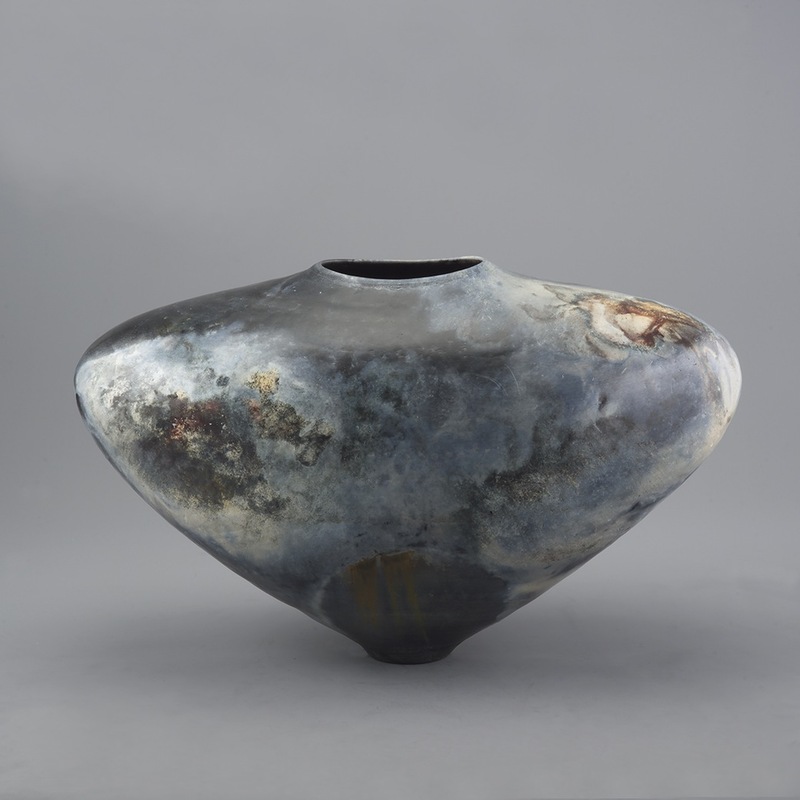 This particular vessel will be on display over the course of the exhibition. Born into a family of potters in Kyoto, Shimizu Uichi was declared a Living National Treasure by the Japanese Government over the course of his extensive career. He established a studio on the shores of Lake Biwa near the Shiga Prefectural Capital of Otsu in the 1970s. He is known for using clay from the site, which contains many fossils and shells, and for experimenting with iron glazing. The color, translucent quality and overall crackling effect epitomize his most celebrated works. Such crackling effects result from a carefully controlled cooling process for which the artist is most well known. This work of art will also be on display over the entire course of the exhibition. Opening to the public on Friday, January 30, Splendors of Shiga: Treasures from Japan is a unique partnership between Meijer Gardens and Shiga, Michigan’s sister state in Japan. The artistic and cultural traditions of Shiga Prefecture are among the most distinguished and profound in Japan. This exhibition will display more than 75 historical works of Japanese art aging back to the 8th century. Shigaraki pottery, delicate scrolls, screens, kimono, and works on paper and wood will all be on display and will change every two months through August. Changing the works on display allows protection of the artifacts as well as a new experience for our visitors throughout the winter, spring and summer. Most of these rare works of art have never been seen outside of Japan, and this collection will not be on display anywhere else in the world. Many of the works are regional and national treasures! 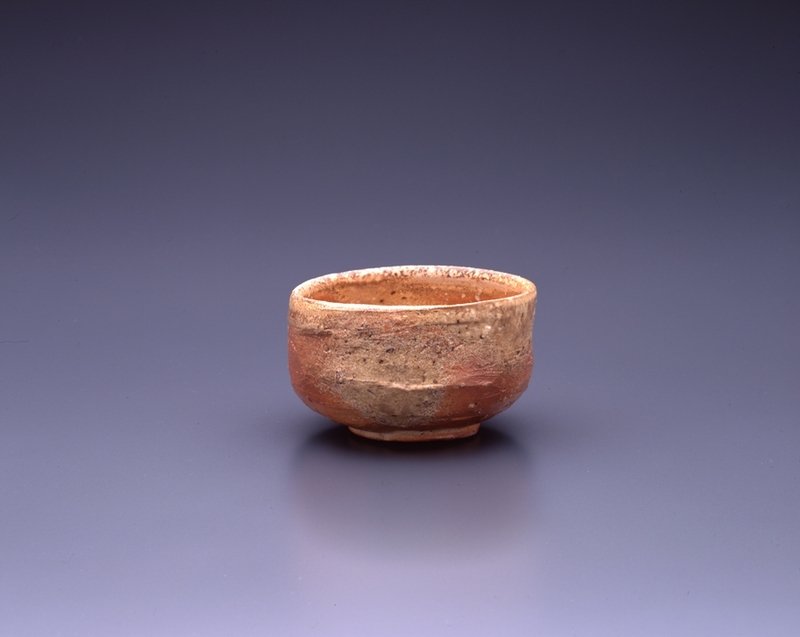 This exhibition highlights masterworks from the collections of: Museum of Shiga Perfecture, Biwako, Bunkakan; Museum of Modern Art, Shiga; Shigaraki Ceramic Cultural Park; and Omihachiman City Museums. Additional works will be on loan from Daiko-ji Temple, Binmanjii Shiseki Bunka Hoshokaii, Taga City Museum, Kannon-ji Temple, Hando Shrine, and Saimyo-ji Temple. Building on the more than 40-year sister-state relationship between the Shiga Prefecture and the State of Michigan, Splendors of Shiga: Treasures from Japan will reflect on and celebrate the cultural richness of Japan in anticipation of the opening of The Richard & Helen DeVos Japanese Garden in June. 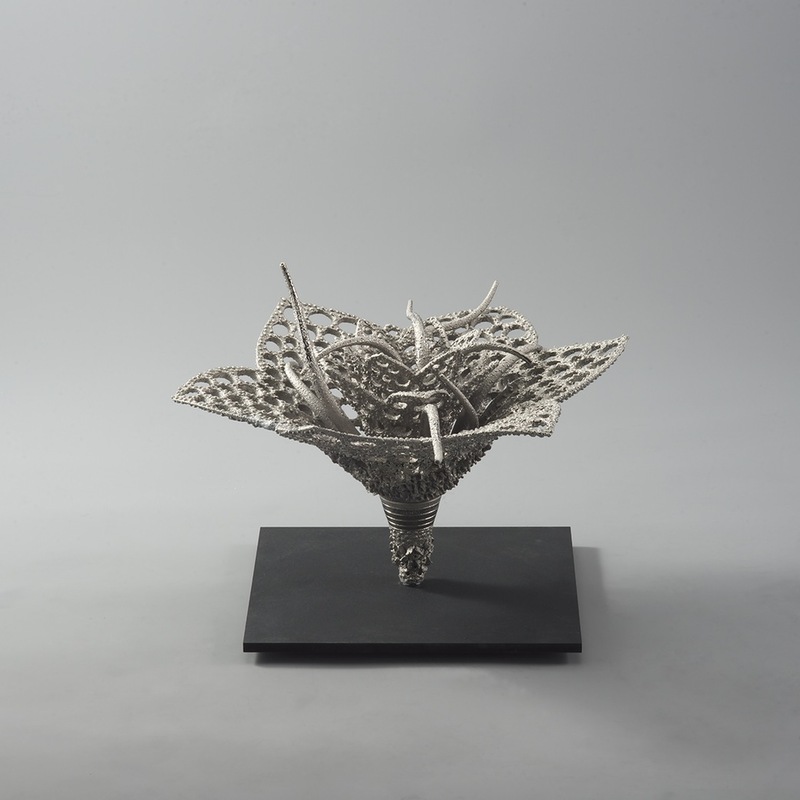 All works shown have been selected by a joint committee of Shiga’s museum and state government officials along with experts from Frederik Meijer Gardens & Sculpture Park. Over the next few months, we will be sharing more in-depth information about the exhibition and the works of art that will be on display. The “winter” portion of Splendors of Shiga: Treasures from Japan will run from January 30—March 22. The exhibition will be temporarily closed from March 23-27 in order to change the artifacts that are on display. The spring display opens on March 28 and will run through June 4. We hope that you can join us for this wonderful and once-in-a-lifetime exhibition!